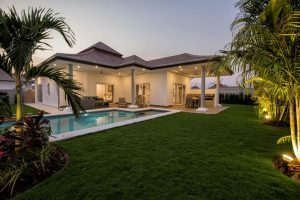 I am writing this article because I am Managing Director of one of the best known, reputable and established property agencies in Hua Hin town and wanted to give our clients some guidance on the do’s and don’ts when buying villas off-plan, obviously our focus is Hua Hin, Thailand but in my opinion you could learn and take advice from this guide wherever you are buying off-plan in the world, the same principles apply no matter where in the World you are looking to buy off-plan property. Buying off-plan property here in Hua Hin has some great benefits but it must be done correctly and with the advice of a real estate agent that has been established here for a number of years, experience is key ! The process for buying off-plan property is generally the same for most projects and so it should be, there is a standard process that’s recognised and if you come across a developer who doesn’t want to follow the process just walk away ! 200,000 Thai Baht Reservation, when your chosen real estate agent has shown you all the best developments that Hua Hin has to offer and you have found the property of your dreams and you would like to proceed with the purchase you would initially place a 200,000 thb reservation down to reserve the plot of land where your house will be built. This is normally a one page basic agreement that describes the property, the sales price, plot number, your name and other personal details, copies of your passports attached and the developers contact details and all other relevant company details. Note : Generally these reservations are non-refundable subject to the successful due diligence that will be carried out by your lawyer. Therefore make sure you have thought things through and are sure that you really want to go ahead with the purchase. We would always recommend hiring a lawyer to process contracts and assist on the purchase, some clients do still choose not to but why wouldn’t you want legal representation on a big purchase such as a property. You would use one buying in your home country and you should use one here in Thailand too. Most clients would generally ask the agent for recommendations in lawyers and the agent should be able to give you the names and contact details of 2 or 3 good lawyers that their customers have used previously, of-course you don’t have to use these lawyers and the choice is yours to use which ever lawyer you would like. Most clients would hire a lawyer here in Hua Hin, as if they have to hire a lawyer from Bangkok there would be at least 2 trips to Hua Hin required and this can lead to heavy costs on your part. Most lawyers charge between 40k – 90k for the fully comprehensive service of a property purchase including sign over at the land office. The developer should and will if they are reputable have their own draft sales and purchase contracts drawn, these will be passed to the lawyer of your choice with all the plot and construction details and the lawyer will fill in the blanks being the names and addresses of the buyers as well as Passport numbers and contact details. Depending on the way your are purchasing there may also be a lease agreement that has to be processed, all good lawyers will ensure this is written with all the latest laws included and have lots of points in the contract that gives you added security, it’s imperative that you use a lawyer to draw this contact. 200,000 Thai Baht reservation to secure the plot. Between 20% and 40% down on contract signing and prior to the start of construction. Staged payments upon construction milestones where pictures will be sent to you. Most developers will give you a construction time of between 8 and 12 months. Around the middle of construction, unless you have done this before you will be required to come to Hua Hin and the project and spend half a day with the development team to choose tiles for the flooring, swimming pool and terrace as well as paint colours for internal walls, kitchen colour, and also if standard the wood colours for built in furniture. When your villa is completed you will come to Hua Hin, if not already here and go through a snag sheet, so the developer if reputable will have a document with every-thing that can snag, you will walk around the villa and check everything is working to the standard it should be, if certain things are flagged and need snagging these should be done within a given time frame, usually 7-10 days and before the furniture is fitted. You will also go to the land department with your lawyer and the developer’s representative and complete the paper work for ownership and the house will be signed over to you. Congratulations, you are now the very proud owner of your brand new villa here in Hua Hin, Paradise City is a name that some people refer to as this wonderful, amazing town that we live !